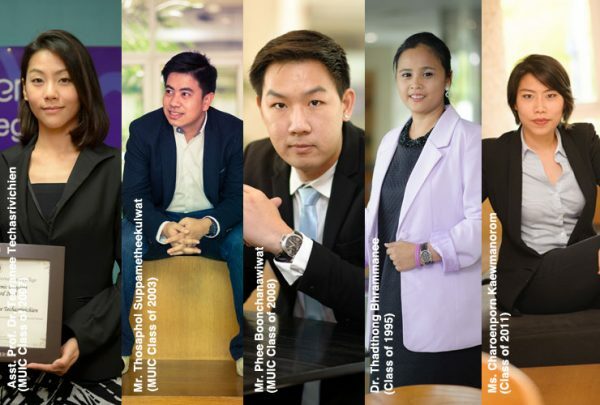 Mahidol University International College (MUIC) is initiating the Outstanding Alumni Award Program to recognize the exceptional contributions to society of MUIC alumni. The program also aims to strengthen the relationship amongst MUIC alumni and encourage them to use their knowledge and skills for the benefit of the community and the nation. 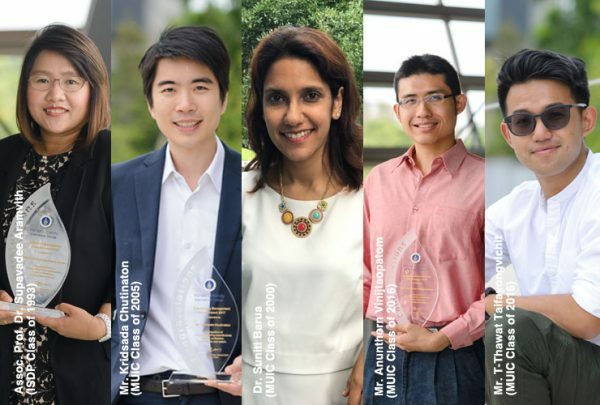 The MUIC Outstanding Alumni Awards are given every year to five alumni who have notable achievements in their respective careers. MUIC would like to congratulate Assoc. Prof. Dr. Supavadee Aramvith, Outstanding Academic Alumni Awardee 2017; Mr. Kridsada Chutinaton, Outstanding Management Alumni Awardee 2017;Dr. Suniti Barua, Outstanding Professional Alumni Awardee 2017; Mr. Anunthorn Vinijtaopatom, Outstanding Community Services Alumni Awardee 2017; and Mr. T-Thawat Taifayongvichit, MUIC Rising Star Alumni Awardee 2017. Assoc. Prof. Dr. Supavadee Aramvith, who received her B.S. Computer Science (1st Class Honors) degree in 1993, obtained her M.S. and Ph.D. degrees in Electrical Engineering from the University of Washington, Seattle, USA, in 1996 and 2001, respectively. She joined Chulalongkorn University in June 2001 and is currently an Associate Professor and the Head of the Digital Signal Processing Laboratory in the Department of Electrical Engineering. With her research specialization in video technology, she has successfully advised 6 Ph.D., 26 Master’s, and 32 Bachelor’s degree graduates. A prolific researcher, she published over 120 papers in international conference proceedings and journals along with four chapters in internationally published books. She has also a rich experience in project management, having served as project leader and former technical committee chair to the NBTC and the former MICT of Thailand. In addition, she is very active in the international arena with leadership positions in international networks such as the JICA Project for AUN/SEED-Net, and professional organizations such as IEEE, IEICE, APSIPA, and ITU. At present, she is a member of the IEEE Educational Activities Board (EAB) and chair of the IEEE EAB Pre-University Education Coordination Committee. Aside from leading the Educational Activities and Women in Engineering committees for IEEE Asia Pacific (Region 10) from 2011-2016, she also won several awards including the most recent, Sak Intania Award 2017, from the Dean of the Faculty of Engineering, Chulalongkorn University in June 2017. Though he graduated with a Computer Science degree in 2005, Mr. Kridsada Chutinaton showed a keen interest in business, starting many enterprises including those related to online advertising and software development. He learned from his experience that accounting system is very important to start-ups. This is the main reason why he started his company FlowAccount with his brother in 2014. FlowAccount.com is an easy-to-use cloud accounting solution designed specifically for Thai small businesses (SME). It helps small business owners with invoicing, expense tracking, payroll and reporting. FlowAccount won in the AIS StartUp 2015 competition, ultimately receiving THB 1 million from AIS and US$2,000 from Samsung Asia. The company was also selected to be among the Top 10 Startups in the Echelon Asia Summit 2015. Two years later, the company received a funding of US$1.15 million from top investors that include SBI Investment (one of the largest fintech VC in Asia), KBank Beacon Venture Capital, Golden Gate Venture, and 500 TukTuks. Mr. Kridsada was recently selected as one of the 100 Faces of Thailand’s Innovation Inspirers (No. 61, “Online Business Person”) and was featured in its book counterpart entitled “100 Faces of Thailand’s Innovation Inspirers” published by Thailand’s National Innovation Agency. After graduating with a Bachelor of Business Administration degree in 2000, Dr. Suniti Barua pursued her Master’s and Doctoral Degree in Psychology, with emphasis on Health Psychology. She finished her Ph.D. in Clinical Psychology degree at the Pacific Graduate School of Psychology at Palo Alto University, Palo Alto, CA (APA Accredited) in 2010. Afterwards, she received the Fellowship Award and Brian Phillip Keith Research Assistantship Award from Palo Alto University. As a licensed psychologist based in America and Thailand and also a member of the American Psychological Association (APA), she has conducted many professional trainings and workshops. Coming from a family that deeply cares for animals, it is no surprise that Mr. Anunthorn Vinijtaopatom—who graduated with a bachelor’s degree in Business Administration major in Marketing in 2016 —has been involved with the family-run CHSAthai animal shelter which takes care of about 1,600 stray dogs, 400 cats, five pigs and one monkey. CHSAthai is a non-profit, charitable, duly-registered, no-kill stray animal shelter located in Saraburi province. Though its capacity is currently full and is facing serious financial challenges, he and his family do their best to help alleviate the suffering of stray animals they come across. The main tasks of their animal shelter are the rescue, sterilization and vaccination of stray animals. Stray animals pose a serious challenge in Thailand due to related issues such as animal cruelty, animal poisoning, community sanitation, serious infectious diseases such as rabies, road accidents, stray animals attack, and others. He and his family began saving stray animals in 2004, financing the shelter’s operations from their own pockets. In 2011, they began to ask for donations due to the financial challenge of taking care of about 1,000 animals. The shelter was finally registered with the Thailand Department of Livestock Development in 2016. Currently a freelance cinematographer, Mr. T-Thawat Taifayongvichit graduated with a degree in Film Production with 1st Class Honors in 2016. His breakthrough short film, “83 Soi Soonvijai 14” earned him several awards: White Elephant Award in the Thai Short Film and Video Festival 2016; the Grand Prize in Film Category in the Young Thai Artist Award 2016; and Director’s Choice Award in the Little Wings Film Festival 2017 in London, UK. His short film was officially selected for screening at Busan International Short Film Festival 2017, Singapore International Film Festival 2017, Kaohsiung International Film Festival Short Film Competition 2017, and Tokyo Sun Film Festival 2017. He was also selected as one of the 24 candidates throughout Asia to attend an 18-day workshop held by the AFA (an educational program hosted by Busan International Film Festival and Busan Film Commission). In the workshop, the selected candidates had to write a script for a short film and vie for prizes. His entry, “Pencil, Money, Whatever, Microphone” won and was selected for short film production at the Asian Film Academy (AFA) 2017 and was also screened at the Busan International Film Festival in the same year. 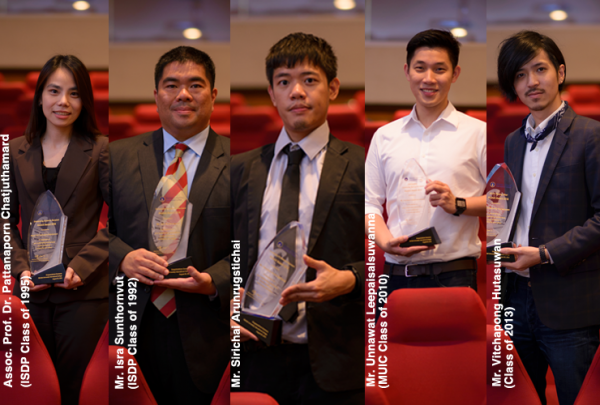 MUIC would like to congratulate Assoc. Prof. Dr. Pattanaporn Chatjuthamard, Outstanding Academic Alumni Awardee 2016; Mr. Isra Sunthornvut, Outstanding Management Awardee 2016; Mr. Sirichai Arungstichai, Outstanding Professional Alumni Awardee 2016; Mr. Unnawat Leepaisalsuwanna, Outstanding Community Service Alumni Awardee 2016; and Mr. Vichapong Hutasuwan, MUIC Rising Star Alumni Awardee 2016. Assoc. Prof. Dr. Pattanaporn Chatjuthamard graduated with a Bachelor’s degree in Business Administration major in Finance from Mahidol University’s International Students Degree Program (ISDP, forerunner of MUIC) in 1995. She then pursued her Master’s Degree in Finance at the University of Wisconsin, Milwaukee, U.S.A. She obtained her Doctoral degree in Finance in the same university in 2002. Currently, Assoc. Prof. Dr. Pattanaporn Chatjuthamard is a lecturer at Sasin Graduate Institute of Business Administration, Chulalongkorn University. She has published more than 20 academic articles in international academic journals and conducted many oral and poster presentations in international academic conferences. She received the Research Publication Award from the Office of Academic Administration, Chulalongkorn University in January and June 2014 and was also the recipient of many research grants from Chulalongkorn University. She received the Summer Research Award at Texas A&M International University in 2005. Mr. Isra Sunthornvut graduated with a Bachelor of Arts in Travel Industry degree from ISDP in 1992. He then obtained his master’s degree majoring in European Studies from Chulalongkorn University. Presently, Mr. Isra is the Secretary-General of the ASEAN Inter-Parliamentary Assembly (AIPA), the producer and host of “Fud Fid Fo Fi” television program for Modernine TV, a weekly columnist for Thai Post newspaper, and also the host of “Kham Khob Fah,” Bluesky/Fah Wan Mai Channel. Spending almost 15 years in the political arena, he was a Member of Parliament (Party List), Democrat Party, in 2013 and the Secretary to the Opposition Leader of the House of Representatives in 2012. He was the Vice Minister Attached to the Prime Minister’s Office and the Deputy Secretary General to the Prime Minister in 2011 and 2010. In 2009, he was the Secretary to the Opposition Leader of the House of Representatives and the Spokesman and Advisor (for Foreign Affairs) to the Governor of the Bangkok Metropolitan Administration in 2006 and 2007. Mr. Isra also received two Thai prestigious and honorable decorations which are the Most Exalted Order of the White Elephant and the Most Noble Order of the Crown of Thailand. Mr. Sirachai Arunrugstichai graduated in 2009 with a Bachelor of Science major in Environmental Studies degree. He then pursued a Master’s degree in Marine Biology at Prince of Songkla University. Currently, he is an award-winning photojournalist, with specific interest in conservation and social issues, a freelance photographer who contributes photos to several publications, and also an active participant in major photography competitions. He is currently under a mentorship program under Thomas P. Peschak, an assignment photographer of the National Geographic Society. He received many national and international awards as a photographer: He won the IUCN GMPP Oceans Photographer of the Year 2016 award, competing against 375 entries from 47 candidates worldwide. This year, he is also the Marine Conservation Photography Grant winner of Save Our Seas Foundation, a non-profit organization which raises awareness about the beauty of marine ecosystems and their fundamental importance to human survival; it should be added here that he is the only Asian finalist. In 2015, he was given the Commendatory Award (DSLR Category) in the Thailand Dive Expo Photo Competition, the biggest international underwater photo contest in Thailand. Other recent achievements include the Grand Prize and the Popular Vote in the Behavior & Biodiversity Category and the 1st Runner-Up and Popular Vote in the Macro Category at the 4th Marine Science Conference 2014; the Grand Prize in the La Mer Love the Sea Competition in 2013; the Grand Prize (Landscape Category) in the Koh Tao Photo Contest; and the Grand Prize (Compact Camera Category) in the Thailand Dive Expo Photo Competition. In 2012, he was the Grand Prize Winner (Underwater Category) in the Koh Tao Photo Competition. Mr. Unnawat Leepaisalsuwanna graduated with a Bachelor of Science major in Computer Science. He is now a web developer at MAQE and a tech plumber at DroidSans.com. He is also active with his voluntary work, being the head organizer and license holder at TEDxBangkok, Thailand. As the person behind the launching of TEDxBangkok, he is also credited with translating more than 60 talks and reviewing more than 150 talks. He started his volunteer work for TED when he was still a junior student. At that time, he found interesting a TED video clip entitled “Why School Kills Creativity” when it was played in his class by one of his lecturers. He then shared this video clip to his friends who remarked that they could not understand many of technical terms in the video. This prompted him to become a volunteer translator for TED, later becoming a TED Language Coordinator, which led to his becoming the head organizer and license holder at TEDxBangkok. The Outstanding Alumni Awards 2016Mr. Vitchapong Hutasuwan is from MUIC’s Class of 2013. He majored in Marketing. Currently, he is the CEO and Creative Director of Selvedgework, a premium custom handcrafted denim workshop in Thailand. It is also the first Thai premium customized brand with prices ranging from 6,900 Baht to 15,900 Baht. With his passion for jeans, he began to set up his own brand named Selvedgework after he graduated. Selvedgework now has three branches located at Siam Squre Soi 2, Emquartier, and Siam Discovery. He plans to expand his brand to Singapore, Hongkong and Dubai. Though only three years old, Vitchapong’s brand has been considered to be among the Top 10 mens’ wear in Thailand by BK Magazine and one of the best denim brands in Thailand by Elle Men. He has been featured in more than 40 magazines such as The Monocles, BK Magazine, Elle Men, Looker, Harper’s Bazaar, Esquire, A Day, and Wallpaper. His brand was also featured in more than 30 TV shows in Thailand and 20 articles on newspapers such as The Bangkok Post, SME, and many others. His brand has also collaborated with Mercedes Benz, W Hotel and Central Embassy. MUIC would like to congratulate Asst. Prof. Dr. Teeranee Techasrivichien, Outstanding Academic Alumni Awardee 2015; Mr. Thosapol Suppametheekulwat, Outstanding Management Awardee 2015; Mr. Phee Boonchanawiwat, Outstanding Professional Alumni Awardee 2015; Dr. Thadthong Bhrammanee, Outstanding Community Service Alumni Awardee 2015; and Ms. Charoenporn Kaewmanorom, MUIC Rising Star Alumni Awardee 2015. Asst. Prof. Dr. Teeranee Techasrivichien graduated from Mahidol University International College with a degree in Biological Science in 2007. She then continued her studies at the Graduate School of Agriculture in Kyoto University, Japan majoring in Agriculture. She achieved her Doctoral degree in Medical Science at the Graduate School of Medicine in the same university. Mr. Thosaphol Suppametheekulwat graduated in Marketing and Management from MUIC. He then obtained his master’s degree from the College of Management Mahidol University majoring in General Management. Mr. Thosaphol received many awards for his achievements in management. In 2007, he received the “Prime Minister Export Award 2007” from PM Surayud Chulanont. In 2012, he was again a recipient of the Prime Minister Export Award, receiving three different awards, namely, “Thailand Best Exporter,” “Thai-Owned Brand,” and “Design Excellence Award.” Currently, he is a finalist in the Phetpanich Award, an award given by the Ministry of Commerce. The winners will be announced on August 21, 2015. In addition to his many awards, Mr. Thosaphol has also been a guest speaker at many talk shows, lectures, and seminars. He has appeared in shows like the “Morning Talk” and seminars like the Ministry of Commerce’s (Thailand) “Brand Building Seminar.” Furthermore, Mr. Thosaphol has also been featured in magazines like SME Today Magazine and was a presenter for Kasikorn Bank’s K-SME Credit Card and THE PREMIER credit card. Mr. Phee Boonchanawiwat graduated from MUIC with a degree in Finance in 2008. After obtaining his degree, he went straight to the business world. Starting as a market analyst at Bangkok Bank, Mr. Phee slowly worked his way through positions in multiple financial security firms until he finally became the famous trader he is now. Well-known in the finance industry, Mr. Phee has written the national bestseller 7 Techniques that Make Money. He has appeared in many shows and TV channels and as a guest speaker to many events. In 2013, Mr. Phee was a guest speaker at MUIC for its การลงทุนในหุ้นไม่ง่ายอย่างที่คิด. In the next year, he spoke during Maybank Kimeng Securities’s “การเป็นโบรกเกอร์ที่ดีทำอย่างไร.” This year has seen him appearing on Money Channel’s (TV) “มือใหม่ Turn Pro”, National Channel’s (TV) “Stop Loss Weekend,” and onstage during the “20 คำถามกับ WIZARD KID” in an event by Globlex Securities, the Stock Exchange of Thailand (SET), and Thailand Future Exchanges (TFEX). Dr. Thadthong Bhrammanee graduated from Mahidol University’s International Student Degree Program (ISDP) in 1995. She then earned a Master’s degree in Business Administration with a major in Information System at the University of Toledo, Ohio, U.S.A. She finished her doctoral degree in Information Management at the Asian Institute of Technology (AIT), Thailand. Dr. Thadthong is now the Chief Information Officer (CIO) and Assistant to the President for IT Strategy at Phetchaburi Rajabhat University. She is also a part-time lecturer at MUIC’s Business Administration Division. She acts as the assistant property manager of their family business, a local real property business and newspaper agency, at Srithaipanit, Phetchaburi. Using the sufficiency economy as her basis, Dr. Thadthong launched a sustainable agricultural farm called “Thonghathai Farm” in Phetchaburi. It serves as a learning base for self-reliance agriculture. The place is located in Nayang Sub-district, Phetchaburi Province, Thailand. The farm’s pioneers have diverse backgrounds and experiences such as information technology and the military; with an interest and enthusiasm to learn and be part of the sustainability path of Thai rural life through the Sufficiency Economy philosophy. Ms. Charoenporn Kaewmanorom is from MUIC’s Class of 2011. She majored in International Business. Afterwards, she received a full scholarship grant funded by the Sievert Larsson Organization enabling her to continue her studies in Intellectual Capital Management at Chalmers University of Technology, one of the top universities in Sweden. In 2013, she was selected to be the country representative to join the ASES Stanford Summit at Stanford University. She worked for The Nielsen Company (a leading American market research company), based in Bangkok. Her position was Consumer Panel Specialist, revealing actual consumer purchasing behavior at category, segment and product levels to major multinational and national clients in FMCG Industry. At the moment, Ms. Charoenporn is a Market Segmentation Consultant at Telenor Group, one of the largest telecommunication companies. She is the youngest consultant at Telenor Group. Her role is to take care of Business to Consumer (B2C) segmentation in 13 markets across Europe and Asia. In 2015, she was assigned to segment for Canal Digital Parabol, the largest TV satellite in Scandinavia. Her upcoming project will take place at Telenor Pakistan.